everything LEB: Faux Flame or Faux Pas? Faux Flame or Faux Pas? For all you design lovers out there, I must know your opinion. Just for the record I am not saying I own any of these,that I like them, or hate them...just wanted to see what you design centerd people think. Hi Lindsay! The flamless are really good for commercial interior design projects, I recommended them for the Wine Bottega. However, of course in the shoot, we use a real candle. HOWEVER, nothing will replace Votivo Red Current. The best smell ever! I don't like them. How's that for a straight forward answer? I think flameless definitely have their place-like above a mantle or if they are in a place near small children, but nothing can replace a real candle-I am loving Voluspa's Champaca Bloom and Fern right now! I prefer the real thing, but there are considerations like pets, kids, klutz husbands, and commercial high traffic areas that make the flameless versions nifty. I was never a fan but an aunt of mine uses them everywhere and they don't look too bad! can't even really tell from afar and I've seen them used in venues or old homes that don't allow real candlelight! I always thought they were cheesy, but Costco has them currently and I just had to try some. I put them inside of some Halloween decorations and they flicker just like real candles. I think they are practical if you are not going to be able to actually see them, just the light. I totally agree w/ the comment about how they work in commercial spaces, I"ve seen some cool ones in a huge lantern in a bar which I thought looked fabulous. I probably would put them on my outside table in NZ where it's super windy..but other than that I prefer a real flame! As a rule, I don't like them. Most look quite tacky. BUT, for parties where there are loads of people milling around and maybe kids, they're so much safer. And no wax drips! I bought little batter-powered tea lights for the carved pumpkins we'll put outside our house - safer, and will last longer. I agree with the comments that in some situations (like commercial applications or if you can't see the flame) they are fine. But, I think real candles always look better. The are good for certain Situations. I used the outdoors in the summer simply due to wind. Also on shelves and other places where a candle might be forgotten and burn. Thanks everyone for your opinions, I basically agree with everyone here. 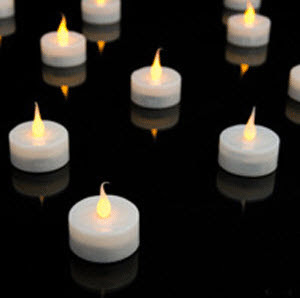 Not a fan but they are great for store displays where you can't keep your eye on a flame...that's about it though! 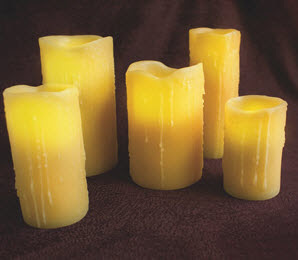 Nooooo to flameless - fake - candles! I had a little fire a few years ago from accidentaly forgetting about a candle that caught fire. $40K worth of damage later (thank God for insurance), I got all kinds of flameless (and even scented!) candles for Christmas. I used them for like 2 days and went back to lighting real flames again. Now, I'm just more careful about putting them out! i agree with most everyone here--- ok in some situations. actually think i'd like to get some before our halloween party because all the little ones around and fire don't mix. (i'm so glad you posted on this because i was just sort of giving up on the candle thing but now we can have some!! :) yay!!!! I'm not a fan... mainly because I light my candles for the smell! !